I am always an advocate of Black & White. In fashion, there is just something about combining B&W together that evoke a chic sophistication. Together B&W are a classic color combination that never go out of style, and paired together they look good on anybody. Additionally, they can easily be mixed and matched to create a casual ensemble, or a professional look, with the right shoes and accessories. I have had this particular outfit (see above) pinned on my Fantasy Closet Pinterest board for about a year now. 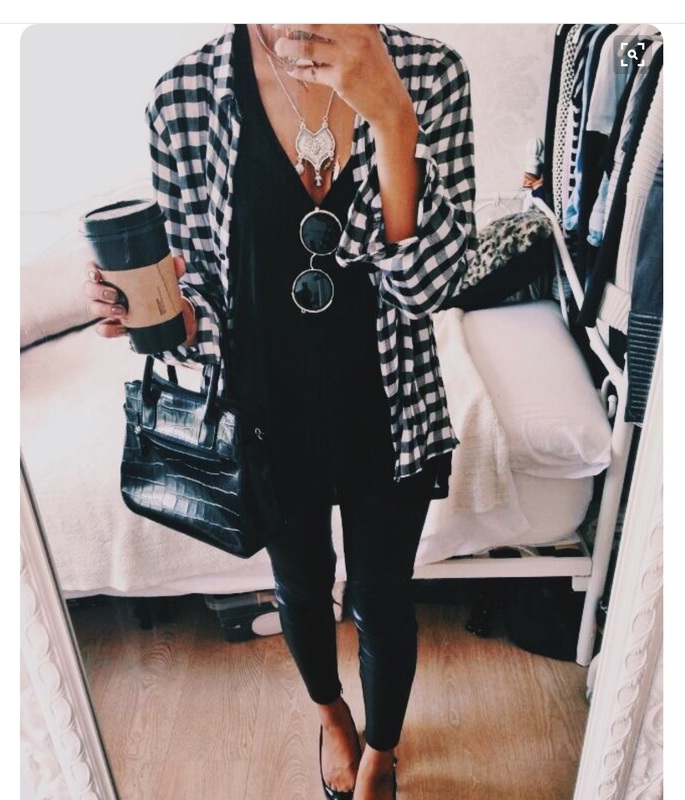 I really enjoy the juxtaposition of the masculine plaid paired with the feminine accessories, and the “neutral” black skinny pants paired with the loose black shirt. This (P)inspiration outfit is most definitely a great “busy-mom-on-the-go” outfit -OR- works as a casual “girls night/date night/going out/anytime” outfit. 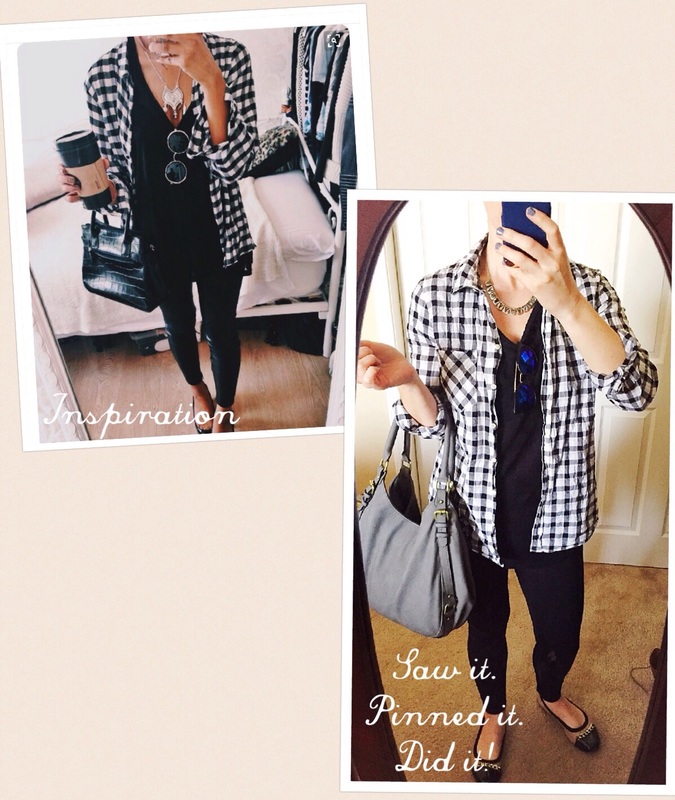 Originally, I had thought it would be a great Finding Fashion Challenge for me because it’s cute, casual, and comfortable- the ideal outfit for busy moms (such as myself, or anyone who loves a great black and white ensemble). Plus, it is a great way to start (or add to) a French Capsule Wardrobe. Here it is, straight from MY closet! A perfect addition to my “mom-on-the-go” wardrobe! I totally LOVE this outfit, and I can honestly say I have worn it plenty of times now, and I am always complimented on it! I definitely feel very casual, cute, and comfortable! The only thing missing from MY version is the coffee. But that is easily remedied! 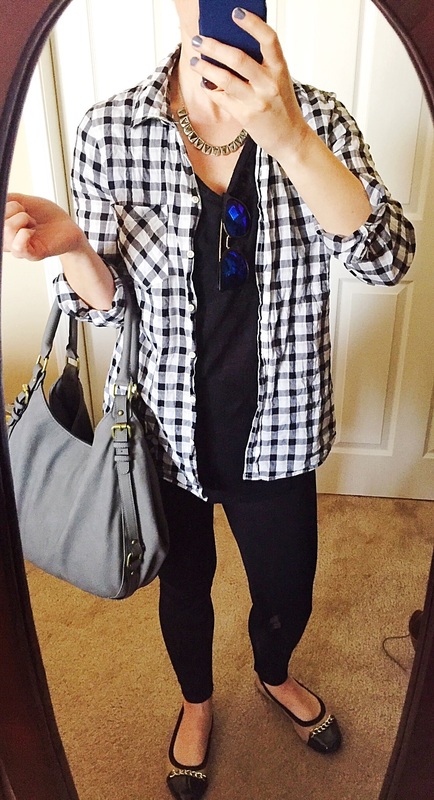 What are some of your favorite “On The Go” type of outfits? Have you ever done a Saw It. Pinned It. DID It! challenge outfit? I’d love to see/hear about what you came up with! 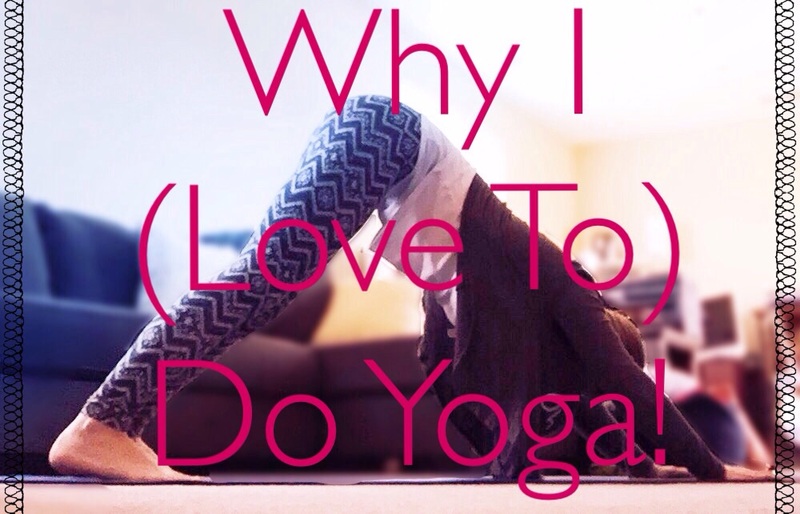 I was recently asked why I personally like to do yoga, and what benefit I get from it. After my quick “I like the way I feel” answer, I began to fully contemplate what I actually enjoy about practicing yoga. I know for many people it’s an all encompassing lifestyle, but for me it’s definitely not that. I am in no way a full out “holistic yogi”- honestly, I don’t even do it everyday. My experience in yoga is mainly an “at home practice” when I have the time and energy to do a session. I have also gone to different classes, and I love the fellowship that comes while doing yoga with others who are around the same experience level as me. It feels great to know that I’m not the only person who gets all wobbly trying to hold the Crecent Moon pose, or has trouble remembering the flow for a Sun Salutation. Yoga helps me feel centered. I really like that each pose makes you totally focus on each specific movement and how your body is reacting to that pose. You focus inward for a moment instead of on what is happening outside your immediate physical body. I enjoy focusing on each pose and staying in that moment, that is what is so relaxing and centering for me. Yoga helps me slow down. From the moment I wake up in the morning I feel like we are on an immediate forward trajectory. Go, go, go! I absolutely love that a yoga session is not a race or rush, but rather a slow progression of movements that focus on specific muscles. I always feel much calmer after a yoga session, and my brain gets a much needed rest. Yoga helps me listen to my body. 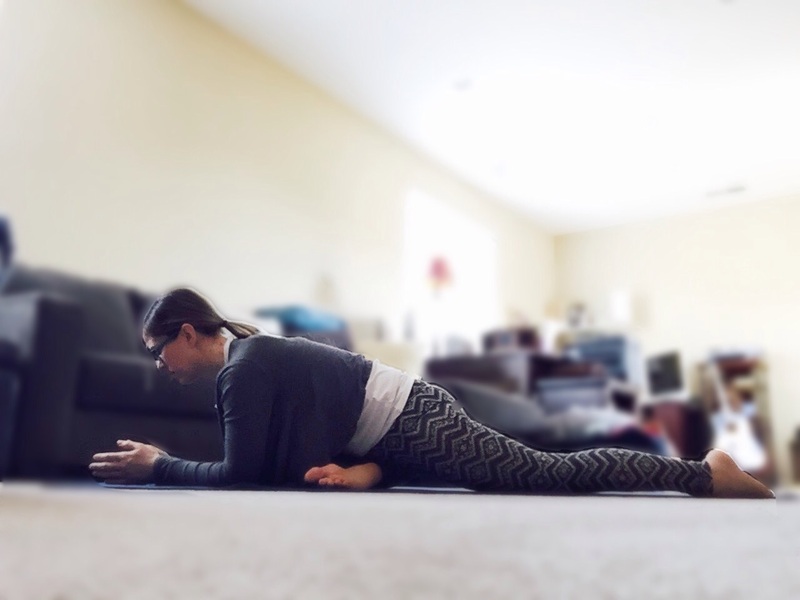 I feel it is so important to notice how your body is reacting to each yoga pose and understand your physical limitations, because if it hurts then you are probably doing it wrong. Now don’t misunderstand me, you will definitely feel a little sore the next day, especially if you are new to yoga. But in practicing yoga you definitely need to know how far you can push your body without physically hurting yourself. Yoga helps me stretch and strengthen my muscles. Instead of numerous and continuous fast paced repetitions to build and strengthen your muscles, yoga poses use your own weight to build strength, as well as slow stretches to relax the muscles. For me, personally, that type of “exercise” feels SO great! Yoga helps me to RELAX! At the end of each yoga session (that I have ever done) is a time for “constructive rest”. During this time I focus on: 1. my breathing, 2. if there is any tightness or tension in my body, 3. nothing else but being in that moment. I try not to focus on anything else, but allow my body to fully relax. Sometimes I even use this quiet time as a time for prayer. 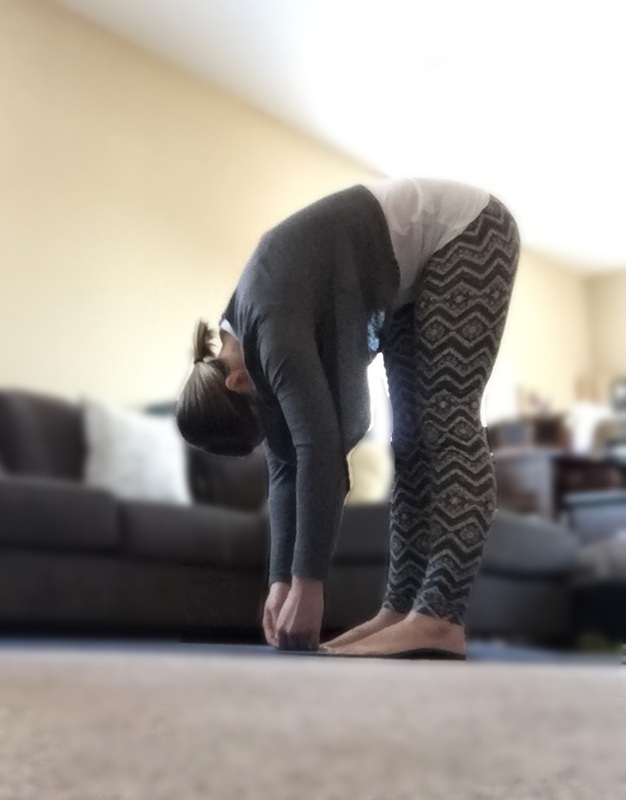 Standing Forward Bend: Here is a how-to, and some benefits of the pose! Pigeon Pose: Here is a how-to and some benefits of the pose! 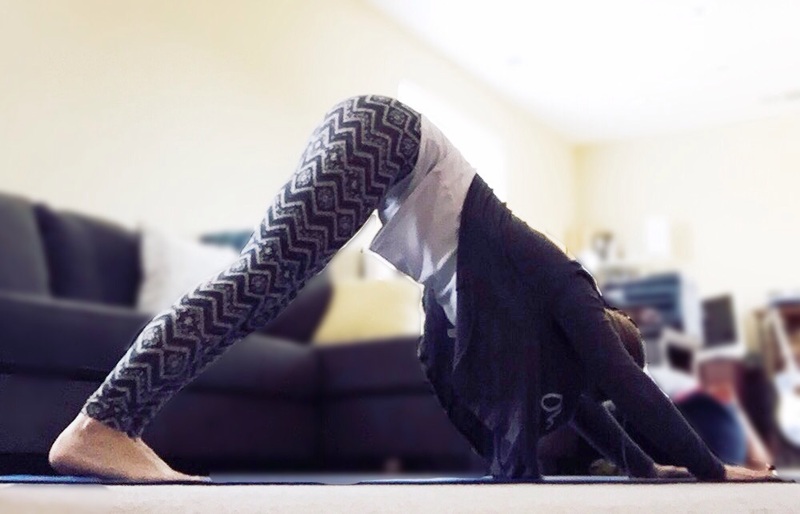 Downward Facing Dog: Here is a how-to and some benefits of the pose! Like I mentioned before, I am in no way a professional yoga instructor. I just really enjoy yoga and have enjoyed some benefits of practicing yoga. If you have never done yoga before and decide to try it out, please make sure to start with a beginning class or video and please listen to your body, and don’t push yourself. Yoga is a practice, not a race. Enjoy!